NOW VERSION 0.4! A Skyrim edition of my Enhanced Night Sky mod. Modifies the stars and galactic nebula with high-resolution replacements made from stellar photography for a dazzling night sky. Many thanks to Wei-Hao Wang for the starfield imagery. Galaxy source image from the European Space Agency Herschel Observatory. Also thanks to Bethesda for creating the base sky texture layer. 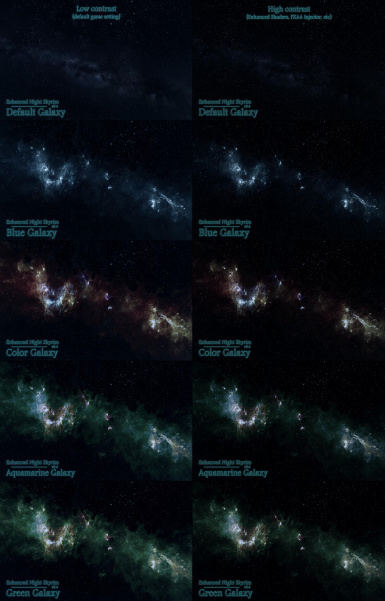 Replaces the star and galaxy textures with high-resolution night sky alternatives. Choose between four varieties of nebula (colorful, icy blue, aquamarine, or green) and four levels of starfield density. Use as a combination, or just the star or galaxy replacement on their own if that's your preference! 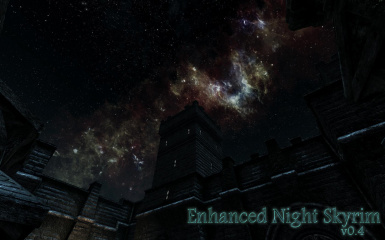 Enhanced Night Skyrim replaces the night sky textures with high resolution alternatives made from real astrophotography - it changes only the stars and galactic nebula background (no other textures are affected, and constellations still appear as normal.) The mod now features four nebula options and four levels of starfield density to choose from. Select one variant of each to install, or use either on their own if that's your preference. I highly recommend also installing a mod to darken the night-time light levels, such as Enhanced Shaders (which is what I use currently) or one of the various FXAA Injector mods. It's not required, but really completes the look for truly dazzling nights. Unzip the "textures" folder from each archive into your SkyrimData folder. 0.2 Added medium- and low-density versions. 0.3 Fixed star textures, revamped density levels, added color and blue galaxies. 0.4 Added green and aquamarine galaxies, new alpha levels for all galaxies, remade mipmaps for all star levels, added new "Lower" star density option. Q. Does this mod interfere with mod X? Q. Does this affect the moons/aurora/constellations/other? A. Nope, this mod only changes the look of the stars and galactic nebula backdrops. Q. Does this mod make nights darker? A. No, but you could try the Enhanced Shader mod or one of the FXAA Injector mods (or similar) to modify your color and lighting levels. Q. What's the difference between the starfield density levels? A. High is the mod default, with the full range of stars visible. Low has a significantly reduced number of stars (though still retains the same overall pattern.) Medium is between the two - not as intense as High, but without as many stars removed as Low. Lower is the most sparse, with more stars than the game default but less than Low. Q. My moon(s) disappeared! What's going on? Please contact me before redistributing this mod. Do not use assets from the mod without permission.